The Supreme Court adjourned to December 3 the hearing of the Maharashtra government’s petition against a Bombay High Court order denying the police a 90-day extension to complete their investigation and file a charge sheet against lawyer Surendra Gadling and others accused of Maoist links in the aftermath of the Bhima-Koregaon violence. On October 29, a Bench of Chief Justice of India Ranjan Gogoi and Justices S.K. Kaul and K.M. Joseph stayed the High Court’s order. A chargesheet had been filed by the police in a Pune special court against Mr. Gadling and four other co-accused on November 15. The High Court passed its order on October 24, opening a window for Mr. Gadling, Nagpur University professor Shoma Sen and activists Sudhir Dhawale, Mahesh Raut and Rona Wilson to seek default bail. They were arrested on June 6 by the Pune police, and a case was registered against them under various provisions of the Unlawful Activities (Prevention) Act, 1967, and the Indian Penal Code. On September 2, the trial court allowed an extension of 90 days. Thereafter, Mr. Gadling and the others moved the High Court, which set aside the trial court’s order. However, the High Court stayed its order till November 1 to give the State time to appeal in the Supreme Court. 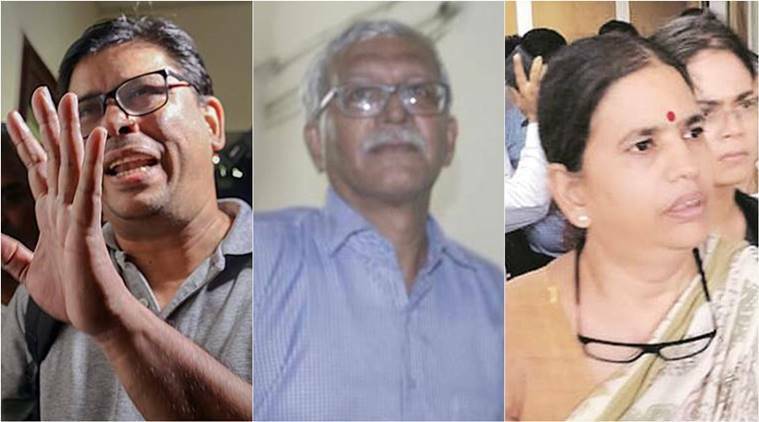 Activists Vernon Gonsalves, Arun Ferreira and Sudha Bhardwaj were accused of having Maoist links and were arrested in June in connection with the probe into Elgar Parishad and Bhima Koregaon violence. A special court in Pune Friday rejected bail applications filed by activists Sudha Bharadwaj, Arun Ferreira and Vernon Gonsalves, who were arrested by the Pune city police on August 28 in connection with the Elgaar Parishad case, for their alleged links with the banned CPI-Maoist. The trio was arrested along with P Vara Vara Rao and Gautam Navlakha, but all five were then put under house arrest as per the order issued by the Supreme Court. The house period of four weeks for the trio ends today. Defence lawyers of Bharadwaj, Ferreira and Gonsalves said they would be filing application before the court seeking time of one week in applying before a higher court for challenging the lower court’s order. The FIR in the case, lodged by Pune resident Tushar Damgude on January 8, initially named Harshali Potdar, Sudhir Dhawale of Republican Panthers, Sagar Gorkhe, and Ramesh Gaichor, Jyoti Jagtap, Deepak Dhengle of the Pune-based Kabir Kala Manch. It claimed that the accused, as per the strategy of the CPI- Maoist, “mislead the Dalits and spread thoughts of violence” in their minds. On June 6, police had arrested activist Rona Wilson, Nagpur-based lawyer Surendra Gadling, Nagpur University professor Shoma Sen, former Prime Minister Rural Development fellow Mahesh Raut and Sudhir Dhawale in connection with the case. Coordination of Democratic Rights Organisation (CDRO) strongly condemns the arrest of activists and lawyers Sudha Bharadwaj, Vernon Gonsalves and Arun Ferreira by Maharashtra police on the rejection of their bail petition by the special court of Additional Sessions Judge K D Vadane in Pune on 26.10.18. In this latest episode of the sordid drama unfolding over the last one and half months, we see a completely unreasoned order by the Additional Sessions Judge which relies on the multiple unsigned and clearly fabricated letters produced by Pune police and released to the media over the last six months as evidence to find the activists prime facie guilty and reject their bail applications. The rejection order does not take into account that Sudha Bharadwaj, Vernon Gonsalves and Arun Ferreira, together with Gautam Navlakha and Varavara Rao, who are the other accused in the case, were never named in the FIR lodged regarding the Elgar Parishad held on 31.12.17 nor were they in any way involved with the organization of the Elgar Parishad. To our greater surprise, we find that the order states that based on the slogans and songs at the Elgar Parishad, the judge comes to the conclusion that war was declared at the Elgar Parishad! The order considers the record of social work and defence of human rights by all the accused but then comes to the conclusion, without any justification, that the social work is just a pretext for doing work for banned organizations and unlawful activities! We find that unfortunately the rejection order parrots the position of the Maharashtra government, without any application of mind and helps in the process of crushing of dissent which is the ultimate objective of this entire chain of events. This started off with the violence by right wing elements against the dalit congregation on the occasion of commemorating the Bhima Koregaon war and then lead on to the arrests of activists, lawyers and academics who have been defending the rights of dalits, adivasis, minorities, peasants, workers and oppressed nationalities. On other hand, the rejection order refuses to take into cognizance that the persons who were accused in the original FIR lodged on the Bhima Koregaon violence, Hindutva leaders Milind Ekbote and Sambhaji Bhide, are roaming around scotfree, and Milind Ekbote was released on bail in the case by the same Pune court. While the Maharashtra government makes no effort to bring the actual perpetrators of the Bhima Koregaon violence to justice, on the other hand it has gone to the Supreme Court to challenge the Mumbai High Court order that cancelled the extension of imprisonment of Surendra Gadling, another accused in the case, under UAPA. It is quite clear from the turn of events that it is the vindictiveness of the Maharashtra government, backed by the central government, which is trying to convey a lesson out of these accused activists, lawyers and academics to all people who express dissent and protest the undemocratic actions of the state, so that all dissent and resistance can be ultimately crushed. The bogey of “urban Maoists” which has been raised to persecute these activists is clearly aimed at camouflaging the continuous actions of the government to target and persecute dalits, adivasis, minorities and other weaker sections of society. 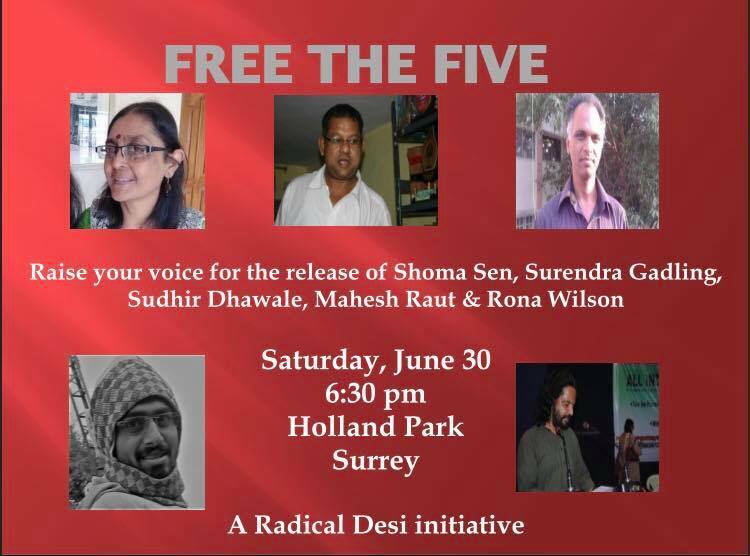 CDRO strongly condemns these actions and demands the immediate release of Sudha Bharadwaj, Vernon Gonsalves and Arun Ferreira, and their co-accused who are already in jail for the last five months, Surendra Gadling, Shoma Sen, Mahesh Raut, Rona Wilson and Sudhir Dhawale, and the withdrawal of the false FIRs against them and all the other accused in the case. On 26 October, a Pune Sessions Court rejected bail applications filed by three activists and human rights defenders. On the same day, the court also rejected Ferreira and Gonsalves’ application seeking a week’s extension of their house arrest. The activists have a history of working to protect the rights of some of India’s most marginalized people. The Maharashtra Police’s subsequent arrest of these activists, despite failing to provide credible evidence against them, is concerning. IAPL condemns the threat issued by Shivaji Pawar, ACP, Maharashtra Police to arrest IAPL’s President Justice Hosbet Suresh (Retd.) and the most alarming portrayal by him of IAPL as a frontal organisation of CPI (Maoist). IAPL believes that such attacks on Judges and Human Right defenders which includes lawyers and organisations, require to be understood in the in the light of rising authoritarianism and fascist attacks in the country. IAPL condemns the threat issued by Shivaji Pawar, ACP, Maharashtra Police to arrest IAPL’s President Justice Hosbet Suresh (Retd.) and the most alarming portrayal by him of IAPL as a frontal organisation of CPI (Maoist). IAPL believes that such attacks on Judges and Human Right defenders which includes lawyers and organisations, require to be understood in the in the light of rising authoritarianism and fascist attacks in the country. It is the need of the hour for all organisations and individuals to come together and resist this onslaught collectively and to strongly condemn and resist this brazen attempt to intimidate Justice H. Suresh (Retd) and members of IAPL. Justice H Suresh, now in his late 80s, is a former judge of the Hon’ble Bombay High Court and is leading figure in Human Rights activism in India. After his brief but glorious judicial service, he led a number of Commissions of Inquiry that investigated violations of human rights. Justice Suresh investigated the Kaveri Riots (1991) in Bangalore, post-Babri Bombay riots (1992/1993) publishing their findings in a 1993 report titled ‘The People’s Verdict’. In August 1995, Justice Suresh issued “Forced Evictions – An Indian People’s Tribunal Enquiry into the Brutal Demolitions of Pavement and Slum Dwellers’ Homes”, a report documenting the use of brutal and indiscriminate force against slum dwellers in Mumbai. In 2000, joined by former Supreme Court judge Justice V. R. Krishna Iyer, Justice Suresh held a two-day hearing into the slum clearances in which about 60,000 people had been evicted. The Inquiry covered both legal aspects of the clearances and the human impact. Stating that there should be a clear distinction between opposition and a bid to overthrow the government, the bench had said that it would look at the Maharashtra Police’s material on the Bhima-Koregaon case with a “hawk’s eye” as liberty cannot be sacrificed at the altar of conjectures. The Supreme Court Thursday reserved its order on the petition seeking an independent probe and the release of the five activists held for the alleged link with Maoists. A bench of Chief Justice Dipak Misra and Justices A M Khanwilkar and D Y Chandrachud also ordered all the sides to submit their written notes by Monday. The five activists — Varavara Rao, Vernon Gonsalves, Arun Ferreira, Sudha Bharadwaj and Gautam Navlakha — were arrested by Maharashtra Police on August 28 in connection with an FIR lodged following the Elgaar Parishad event held on December 31 last year that had later triggered violence at Bhima-Koregaonvillage. Stating that there should be a clear distinction between opposition and a bid to overthrow the government, the bench had said it would look at the Maharashtra Police’s “material” on the Bhima-Koregaon case with a “hawk’s eye” as liberty cannot be sacrificed at the altar of conjectures. According to the Maharashtra Police, material recovered from six alleged Maoist cadres arrested before the five were held had thrown up “concrete material requiring and justifying” the arrests. The apex court had earlier slammed the Maharashtra Police for making statements related to the arrests in the press, even as the court proceedings are underway. ALERT! ALERT! State Repression ALERT! Just received a message that the Pune cops are simultaneously raiding Arun Ferreira and Susan Abrahams-Vernon Gonsalves residences. Arrests likely as cops extend Bhima Koregaon charade.. Please share widely. And media friends, please cover this! Human Rights Defender Sudha Bharadwaj has been arrested from her home after it was raided and she has been taken to Surajkund police station. This is part of a larger trend of the state cracking down on activists across the country. Since 6 am today, activists across 5 states (Goa, Telengana, Maharashtra, Jharkhand and Delhi) have had their homes raided, personal belongings confiscated, they have been interrogated and some have been arrested. Along with Sudha Bharadwaj, Gautam Navlakha, Varavara Rao, Vernon Gonsalves have also been arrested. Sudha Bharadwaj (now at Surajkand Police station) will be taken to Sector 12 CJM court shortly! Delhi and Haryana friends, ALL of are you requested to reach Sector 12 CJM court Haryana in huge numbers! Stand in solidarity against state repression on activists and lawyers! Varavara Rao, Kranthi Tekula, Prof. k Satyanarayana (EFLU), K V Kurmanath residencies in Hyderabad are in raid by Pune police. Democratic Students’ Union Condemns this raids. And letter claimed to be recovered from Rona Wilson is vexatious. It was written by State to suppress the dissent across India which is smouldering against Hidutva State and it’s anti people policies. N.B. Arun Ferreira represents detained lawyer Surendra Gadling who, along with Vernon Gonsalves, are members of the Indian Association of People’s Lawyers (IAPL). Sudha Bharadwaj is presently being held in a Toyota Innova stationed on the dark road outside the house of the CJM in sector 15A, Faridabad. The roads in the area are v dark and dimly lit. the Pune Police and Surajkund Police were called into the house of the Ld CJM. After some persuasion the counsels representing Sudha Bhardwaj were also allowed into the CJM house. Adv Vrinda Grover was first asked to make her submissions in the driveway of the house itself. After addressing the CJM briefly, she requested the CJM to permit her to make her full submissions in a proper manner as the driveway was dark and it was impossible to show any documents. The CJM then invited all the counsels to wait inside the house. Adv Vrinda Grover further informed the ld CJM that some applications need to be presented. The CJM stated that he was informed that the Hon’ble Chandigarh HIgh Court had passed an order in the case of Sudha Bharadwaj. The CJM has yet to hear the counsels on behalf of Sudha Bharadwaj both on facts and on Law. The CJM has gone to the residence of the district judge for advice on the matter. It is midnight and the counsels are waiting at the residence of the CJM while Sudha Bharadwaj is being detained in a vehicle on the road. “After all the tense situation and being kept in the vehicle in a shady spot for so long, Sudha is finally brought inside and she is now sitting [at her home] with the lawyers”, according to one observer. Join us large tomorrow i.e. 29th Aug. in protest demonstration at Ambedkar Statue, Liberty Circle Hyderabad. At 11am. Against arrest and raids on rights activists, advocates and Writers. Yes There is Huge Maoists Sympathisers Crackdown! All these Raids r conducted in Lieu of Bhima-Koregaon Violence!! Varavararao,Father Stan Swamy, Arun Ferreira,Gautam Navalekha!! STRONGLY CONDEMN THE ARRESTS OF CRPP EXECUTIVE MEMBER VERNON GONSALVES, ADVOCATE SUDHA BHARADWAJ, ARUN FERREIRA, GAUTAM NAVLAKHA, VARAVARA RAO, AND KRANTI TELUKA BY THE MAHARASHTRA POLICE, AND THE RAIDS CONDUCTED AT THE HOMES OF FATHER STAN SWAMY, ANALA, KUMARANTH, ANAND TELTUMBDE AND PROF. SATYANARAYANA OTHERS. In yet another brazen act to stifle dissent, the Maharashtra Police have arrested Vernon Gonsalves, who is an Executive Member of the CRPP, and well known activists and lawyers Advocate Sudha Bharadwaj, Gautam Navlakha, Arun Ferreira, revolutionary poet Varavara Rao, and Kranti Teluka. Raids were also conducted across Goa, Jharkhand, Delhi, and Telangana in the houses of Anand Teltumbde, Father Stan Swamy, Anala, Kumaranth, Prof. Satyanarayana and many others. Right at the time when the terror plots by the rightwing Sanatan Sanstha is emerging, the bogey of assassination plot on the Prime Minister is re-invoked and these arrests and raids are carried out. More importantly, the 90 day period of judicial custody for the five activists arrested in the month of June 2018 is just about to end and the charge sheet is yet to be filed. At this time, when the police narratives are falling apart, these arrests reveal the desperation of the Maharashtra police to shut down all criticism by arrested more activists. Today’s action by the Pune police reeks not just of diversionary tactics, but also a ploy to extend the custody of Professor Shoma Sen, Advocate Surendra Gadling, Mahesh Raut, Sudhir Dhawale, and Rona Wilson. While those who unleashed violence on Dalits in Bhima Koregaon are roaming free, Dalit and adivasi intellectuals and Human Rights Activists who have stood by them are being targeted by the state. These arrests and raids are a blatant attempt at stifling dissenting voices revealing a sinister, premeditated and politically motivated effort to malign the arrested and discredit them through branding instead of evidence. It is crucial to note that this effort at using the full might of the law is revealed in the sections of the IPC and UAPA used against the arrested. These include IPC 153A – promoting enmity between different groups of people, 505 – statements conducing public mischief, 117 – abetting commission of offence, 120B – criminal conspiracy; under UAPA 13 – unlawful activities, 16 – terrorist acts, 17 – raising funds for terrorist acts, 18 – conspiracy, 18B – recruiting persons for terrorist act, 20 – member of terrorist gang or organisation, 38 – membership of terrorist organisation, 39 – support to terrorist organisation, 40 – raising funds for terrorist organisations. The intention of the police becomes amply clear when we note that each of the arrested persons are well regarded human rights activists who have publicly worked for the rights of dalits, adivasis, minority communities, women’s rights, workers’ rights and spoken and written extensively about the policies of the state. Moreover, all of the persons targeted by the state have been steadfast and resolute in their stands for decades. These charges, none of which stand up in front of slightest of scrutiny, is meant merely to incapacitate and silence these voices by sending them to custody for extended periods of time. 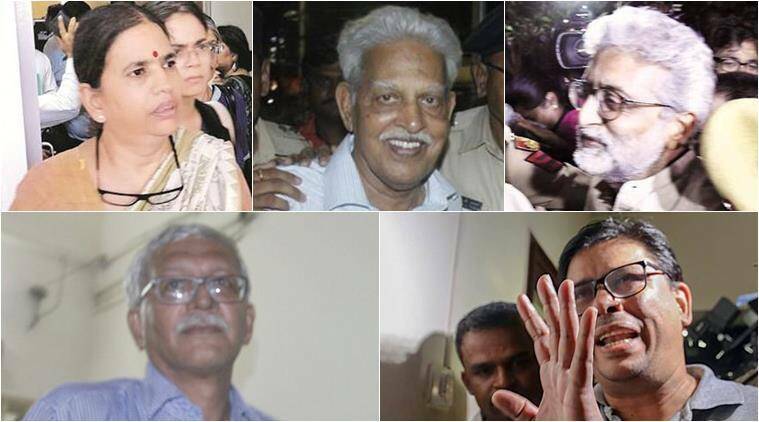 The raid at the homes of Susan Abraham and Arun Ferreira and the eventual arrests of Ferreira and Vernon Gonsalves patently reveals the effort to scuttle possibility of establishing a case for the release of the five arrested in connection with Bhima Koregaon in June. Now, with the arrests of the lawyers fighting the case, the Maharashtra police are making all efforts to ensure that all those who stand with the spirit of democracy are denied all democratic rights. The efforts being made to scuttle the High Court stay on the transit remand of Gautam Navlakha and Sudha Bharadwaj is another instance where the upholders of law are willing to do anything to blatantly abuse and disregard the law. The efforts to illegally take Sudha Bharadwaj to Pune, despite the Punjab and Haryana High Court order putting a stay on the remand, clearly indicates the maliciousness of the police force. The gherao of an unprecedented number of police personnel during the arrest of Varavara Rao and the ransacking of his home is another such instance of police brutality. The search of Anand Teltumbde’s residence during his absence is patently illegal and raising concerns about the extent to which the police will go to clamp down and spread fear among people. The extended interrogation of Father Stan Swamy in Ranchi, Jharkhand, and Prof. Satyanarayana in Hyderabad while keeping them confined to their residence since early morning and denying any legal assistance is another such instance of police highhandedness. The order for the raid and arrests, coming from Swargate Police Station in Pune, is motivated to foist false cases on democratic rights activists through fabrications and strong-arm tactics. The callous disregard for the rule of law and the fundamental rights of people by the institutions of the state reveals a stark image of a fascist Indian State. CRPP strongly condemns these raids and arrests and demands the immediate and unconditional release of all arrested in connection with the Bhima Koregaon case. Committee for the Release of Political Prisoners demands an end to all such ‘operations’ by the Maharashtra police, stands in solidarity with all such voices of democracy and is determined to fight this vicious assault on all those who dare to speak out against the violence of the state. CONDEMNING THE ARRESTS OF PROMINENT HUMAN RIGHTS ACTIVISTS FOLLOWING SIMULTANEOUS MULTI-CITY RAIDS BY POLICE ON 28TH AUGUST 2018. On 28th August 2018, simultaneous raids were conducted by Police on the premises of prominent human rights and civil liberties activists and intellectuals – Advocate Sudha Bharadwaj (National Secretary, PUCL) in Faridabad, Father Stan Swamy in Jharkhand, Senior Writer and Poet Varavara Rao, his two daughters – Anala and Pavana, ‘The Hindu’ journalist KV Kumaranath, English and Foreign Languages University (EFLU) Professor Satyanarayana, ‘Namaste Telangana’ journalist Kranthi Tekula – all in Hyderabad, Anand Teltumbe (General Secretary, CPDR) in Goa, Gautam Navlakha (founder member, PUDR) in Delhi, Arun Ferreira, Writer Vernon Gonsalves and Advocate Susan Abraham in Mumbai, and several of them have been arrested on false and fabricated charges under the draconian UAPA law. WE the aforesaid civil society organisations/ groups/ collectives, are jointly convening an urgent Press Conference to condemn the appalling state actions of reprisals against noted human rights activists and intellectuals, which are clearly politically motivated and an attempt to stifle voices of dissent. The unjustified raids on and arrests of the above public spirited individuals who have tirelessly worked for the cause of the poor and marginalized sections of society, are nothing but an attack on Indian democracy and an attempt to undermine the democratic fabric of our society. We request you to attend and / or depute a reporter to cover this event. On June 6, many of us who knew one or few of the five people arrested, supposedly in connection with the ‘violence’ at Bhima Koregaon, woke up with hasty messages of unexpectedarrests. I received a message that Dalit activist Sudhir Dhawale was ‘picked up’ and had been taken to the Govandi police station in Mumbai. A huge crowd gathered outside the police station demanding to know the reasons for his arrest. But for Dhawale, who has been a face of some of the massive protests in Maharashtra in recent times and has similarly been implicatedin false cases earlier, arrests were not so unexpected.Amid protests from the crowd, the Govandi police took Dhawale to Pune from the backdoor. As the day unfolded the shock meter rose manifold as unexpected and unwarranted arrests followed. While a reputed lawyer Advocate SurendraGadling was almost simultaneously being arrested from his Nagpur residence, one came to know that some Rona Jacob Wilson from Delhi and one Mahesh Raut working in Gadhchiroli had also been arrested. Raids were conducted at ex-Nagpur University Professor Shoma Sen’s house and she too was arrested. All had been accused of one crime- inciting violence at BhimaKoregaon. I watched in horror and shock as all these arrests were taking place, as both, an eye-witness of January 1 events at BhimaKoregaon memorial and as someone who broke the news and followed it through the months. When Dalits were attacked at BhimaKoregaon, on an occasion meant to be a celebration- the bi-centenary of the battle of BhimaKoregaon – anger spilt out on streets of Maharashtra taking the form of a spontaneous, people’s protests.